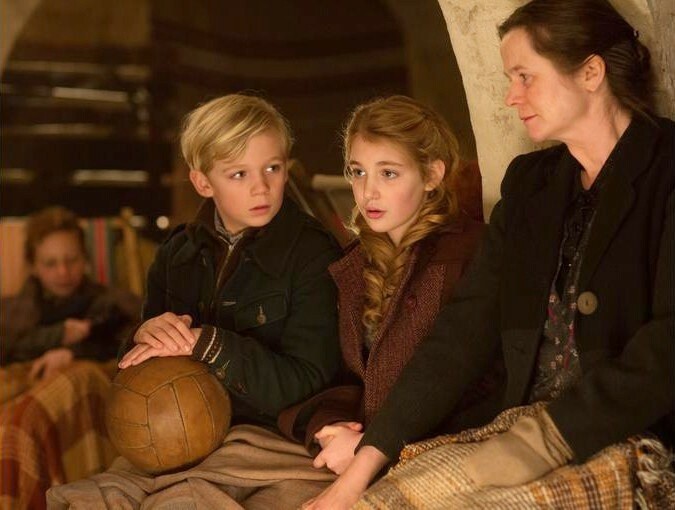 You may have seen the trailer for The Book Thief which practically screams “GIVE US AN OSCAR! THERE’S NAZI GERMANY, PROMISES OF INSPIRATION, A JOHN WILLIAMS SCORE, AND GEOFFREY RUSH! WHAT MORE DO YOU WANT? !” (In the end its only nomination was for best original score – after all, it is John Williams). The Book Thief looks and sounds beautiful, but ultimately I was a little disappointed with the end result. The Book Thief is based on the novel by Markus Zusak, and traces the experiences of young Liesel (Sophie Nélisse) against the backdrop of Nazi Germany. 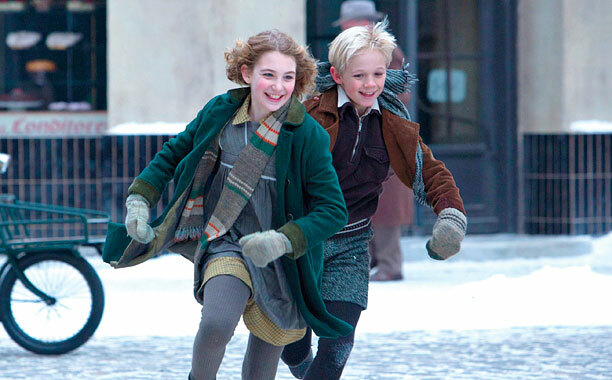 Liesel is fostered by sweet Hans (Geoffrey Rush) and stern Rosa (Emily Watson) and begins a love affair with books. It’s called The Book Thief because she supposedly steals books to teach herself how to read, except we only see her read about four, and I think we only see her actually steal three (I was expecting her to steal hundreds! ), though I wouldn’t be surprised if a lot has been cut from the book. Liesel’s foster parents hide a young Jewish man, Max (Ben Schnetzer) in their basement and her love of reading is loosely tied to this development. I haven’t read the critically-acclaimed book but I assume some of what made it so revered is missing from the film adaptation. Namely, the novel is narrated by Death, whereas in the film we only hear his voice-over at the beginning and end, and once or twice in between. I think having the story told from this perspective is what probably made the book so unique, whereas here it’s just another “inspirational” war movie. Maybe it’s the fact that the film is shown from a child’s perspective, who doesn’t quite understand the war unfolding around her, which is meant to offer a unique cinematic experience. But in that regard, The Boy in the Striped Pyjamas (Mark Herman, 2008) is way superior, and I think this film would have been more successful if it had used the perspective of Death instead (though how that would have been achieved is another matter). I was disappointed that there was no twist as I had half-expected one. It moved incredibly slowly and I kept waiting for the big pay-off which didn’t quite come. I told myself multiple times throughout the film that I was soooo going to cry at the end, but I didn’t shed a single tear. It’s almost like they sped through the emotional parts instead of doing what you’d expect for this type of film which is milking them for all they’re worth (and I’m sorry but I LOVE when films do that!). Having said that, my friend did cry so maybe I’m just a cold emotionless freak (though I cried in Frozen so I doubt it). Criticisms aside, here’s what was good: Geoffrey Rush (is he ever not? ), Emily Watson (she was great), Sophie Nélisse (she convincingly pulled off Liesel’s developing maturity, though maybe that was mostly attributed to her changing hair length), the gorgeous character of Rudy (as well as the young actor who played him, Nico Liersch), the set design and cinematography (beautiful), and the score (John William’s 49th Oscar nomination – say whaaaat?!). I wouldn’t say the trailer gives away the whole story, but there isn’t much more to the film beyond it. It wasn’t bad, but it wasn’t as magical as I had hoped.